Wed., March 1, 2017, 12:36 p.m.
LONDON – How much is an old, dried out piece of mold worth? Apparently more than $14,600 if it was created by the doctor who discovered penicillin. The nearly 90-year-old swatch of mold has a rather extraordinary history: It came from the laboratory of Dr. Alexander Fleming whose revolutionary discovery brought the world its first antibiotic, credited with saving millions of lives worldwide. He noted that other bits of mold were given to Pope Pius XII, Winston Churchill and Marlene Dietrich, perhaps in an effort to cement Fleming’s legacy as the discoverer of penicillin in 1928. In some ways, the discovery was accidental. 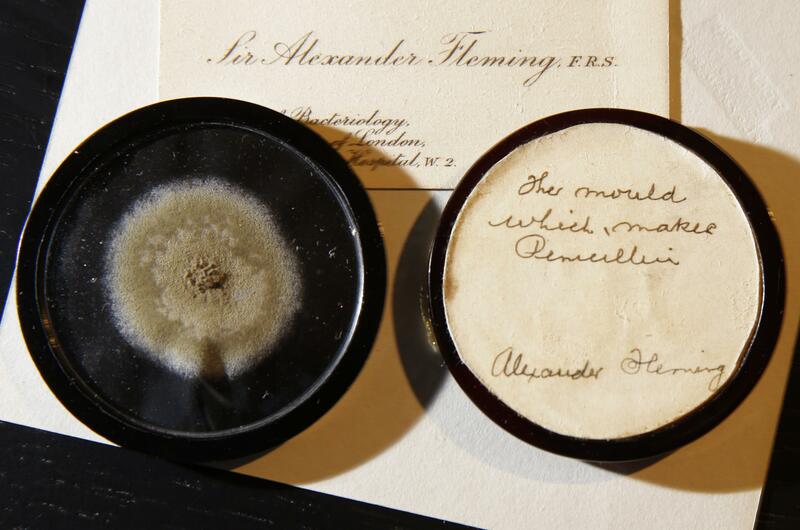 Fleming found mold growing in an experiment when he returned to his cramped lab after a stay at his country house. One petri dish was full of bacteria except for an area where mold was growing. He later realized the mold – a rare strain of penicillin – was killing off the bacteria around it. Scientists at Oxford University further developed penicillin, and production was ramped up so that enough of the antibiotic would be available for the Allied invasion on D-Day in 1944. Fleming and Oxford scientists Ernst Boris Chain and Howard Walter Florey were awarded the Nobel Prize in medicine in 1945. Published: March 1, 2017, 12:36 p.m.